Well I'm afraid my resolution to stay away from the newsagent shelves has wavered somewhat when I spotted this set of dies and stamps which I just couldn't resist. Originally I'd thought that maybe these 'freebies' would be of lesser quality than dies you could buy but this isn't the case because they always seem to cut really well - this set is no exception and I can see there will be lots of ways to use them. 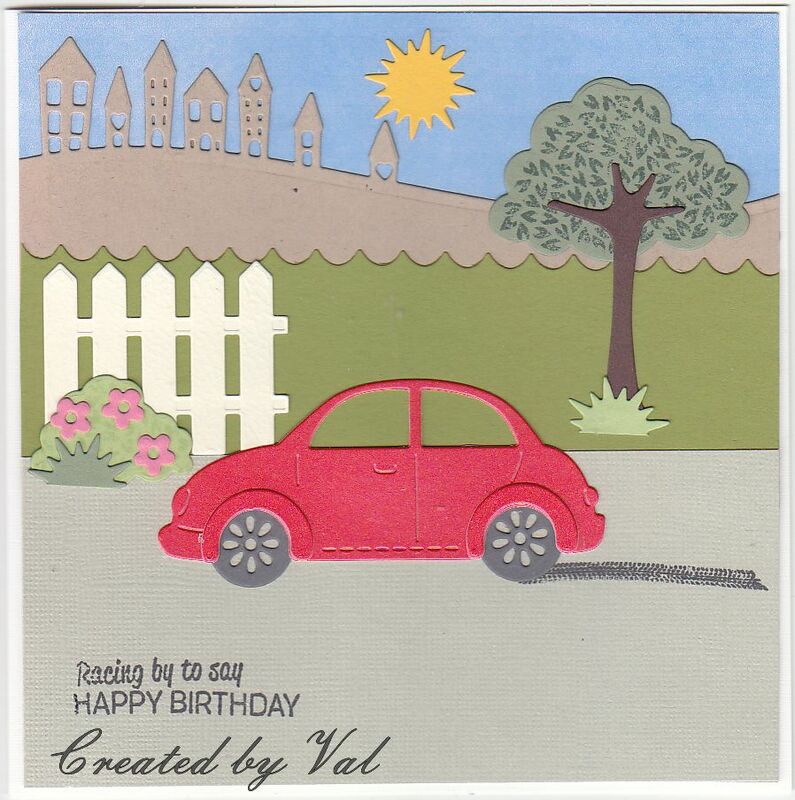 I've incorporated a die which I already had to cut the hill and houses, the 'grass' layer was a piece of waste from cutting a border for another project and the main part of the scene has used just some of the dies and stamps in this current free set. Oh, and the picket fence was another free die from a previous magazine give away. I had fun cutting out all the pieces and assembling them into a cheery scene and of course all of the pieces apart from the base card are from my bits boxes. What a fabulous scene Val! I bet it was great fun to create too, love it! Ha Ha Ha, know just what you mean Val, I can't resist taking a look at the shelves. Although they have normally sold out in our local. Such a great little scene you've made here. Fantastic scene Val, least you have used yours, I tend to buy for the freebie and not very often use,,lol.